Neutrophils are recruited to the site of parasite inoculation within a few hours of infection with the protozoan parasite Leishmania major. In C57BL/6 mice, which are resistant to infection, neutrophils are cleared from the site of s.c. infection within 3 days, whereas they persist for at least 10 days in susceptible BALB/c mice. In the present study, we investigated the role of macrophages (MΦ) in regulating neutrophil number. Inflammatory cells were recruited by i.p. injection of either 2% starch or L. major promastigotes. Neutrophils were isolated and cultured in the presence of increasing numbers of MΦ. Extent of neutrophil apoptosis positively correlated with the number of MΦ added. This process was strictly dependent on TNF because MΦ from TNF-deficient mice failed to induce neutrophil apoptosis. Assays using MΦ derived from membrane TNF knock-in mice or cultures in Transwell chambers revealed that contact with MΦ was necessary to induce neutrophil apoptosis, a process requiring expression of membrane TNF. L. major was shown to exacerbate MΦ-induced apoptosis of neutrophils, but BALB/c MΦ were not as potent as C57BL/6 MΦ in this induction. Our results emphasize the importance of MΦ-induced neutrophil apoptosis, and membrane TNF in the early control of inflammation. Polymorphonuclear neutrophils (PMN3 or neutrophils) are the first inflammatory cells recruited to tissues following infection with a high inoculum of Leishmania major. They represent an essential component of the acute inflammatory response and subsequent resolution of a microbial infection. PMN have been described as terminally differentiated, short-lived cells incapable of cell division that undergo spontaneous apoptosis within hours as a circulating cell in the peripheral blood. However, their limited lifespan is significantly increased up to several days under inflammatory conditions (1, 2). PMN, once exposed to microorganism-derived stimuli, have been reported to synthesize and release numerous proteins including cytokines and chemokines (reviewed in Ref. 3). Several of the PMN-secreted cytokines were shown to influence the outcome of infections caused by fungi, bacteria, and protozoa (3, 4, 5, 6). Infection with the intracellular protozoan L. major leads to self-healing cutaneous lesions in mice of most inbred strains such as C57BL/6. A small lesion develops that heals slowly until it becomes fully resolved within 5–6 wk after L. major inoculation. These mice are subsequently protected from developing any lesions upon reinfection and are thus referred to as “resistant” to infection with L. major. In contrast, in a few susceptible strains of mice such as BALB/c mice, inoculation of L. major leads to the development of a lesion that does not heal. These mice will develop a lesion even upon reinfection and are referred to as “susceptible” to infection with L. major. Resistance and susceptibility to infection have been correlated with the development of CD4+ Th1 and Th2 responses, respectively (reviewed in Ref. 7). Following s.c. infection with L. major, the composition of the early cellular infiltrate differs significantly between resistant C57BL/6 and susceptible BALB/c mice. As early as 1 day after infection, in resistant C57BL/6 mice, the macrophage (MΦ) to neutrophil ratio is two times higher than in BALB/c mice, and the number of PMN was shown to decrease significantly 72 h after parasite inoculation with MΦ, becoming more dominant in the cellular infiltrates thereafter. In susceptible BALB/c mice, elevated numbers of PMN were reported to persist for >10 days after infection, reflecting sustained inflammation (8, 9, 10). We have previously shown that removal of PMN in susceptible BALB/c mice before infection with L. major induces a partial healing of the otherwise nonhealing lesions and modifies the profile of cytokines secreted by CD4+ Th cells. On the contrary, transient removal of neutrophils in resistant strains of mice does not affect the final outcome of the disease (10). Because the early persistence of neutrophils in susceptible mice was shown to have a significant impact on the course of infection with L. major, we investigated in this study the mechanism(s) determining the control of neutrophil number in L. major-induced lesions in resistant vs susceptible mouse strains. In this study, we report that one of the mechanisms regulating the number of neutrophils at the site of infection includes MΦ-induced neutrophil apoptosis, a process which is further amplified in the presence of L. major. Expression of membrane TNF (mTNF) on MΦ is necessary to induce PMN apoptosis, indicating that induction of neutrophil apoptosis by MΦ is tightly controlled by TNF. This mechanism may constitute an essential process in the control of the early inflammatory lesions and crucially determine the control and outcome of the disease. Female BALB/c and C57BL/6 mice were purchased from Harlan Olac. Female memTNFΔ/Δ mice (11) were bred in the animal facility of the Department of Pathology (University of Bern, Bern, Switzerland). B6.TNF−/− (12) were obtained from Dr. Marino (Ludwig Institute for Cancer Research, New York, NY) and subsequently bred in the pathogen-free facility at the BIL Epalinges Center. All mice were used at 6–8 wk of age. L. major LV 39 (MRHO/Sv/59/P strain) were maintained in vivo and grown in vitro as described previously (13). Groups of 2–3 mice were infected i.p. with 5 × 107 stationary phase L. major promastigotes in a final volume of 1 ml, or mice were injected with 0.5 ml of 2% starch in PBS. Peritoneal neutrophils were obtained 4 h after injection, whereas MΦ were isolated 16 h later. Peritoneal neutrophils isolated 4 h after inoculation of 5 × 107 L. major, or bone marrow (BM) neutrophils, were isolated by positive MACS selection (Miltenyi Biotec) with PE-conjugated anti-Ly6G (1A8), purchased from BD Pharmingen. Flow cytometry analysis was performed on a FACScan using CellQuest software (BD Biosciences). Neutrophils of 95–98% purity, as assessed both by FACS analysis, and cytospins of isolated cells were stained using Diff-Quick (Dade Behring) and then counted and incubated in presence of MΦ. Peritoneal MΦ were isolated 16 h after injection with L. major, or 2% starch, by peritoneal washings and were further purified by Ficoll gradient (Amersham Biosciences), counted, and left to adhere for 3 h in 24-well plates at 37°C. After removal of nonadherent cells and several washings, MΦ were fixed with 500 μl of 1% paraformaldehyde in PBS for 45 min, washed three times with PBS, and incubated with neutrophils. In selected experiments, MΦ were detached with 5 mM EDTA and incubated for 1 h with LPS (1 μg/ml). Cells were preincubated with 24G2 mAb (anti-FcRγIII Ab) and/or unconjugated rat anti-mouse TNF mAb (XT22) (both from BD Biosciences) and stained with FITC-conjugated F4/80 mAb (Caltag Laboratories) and PE-conjugated rat anti-mouse TNF mAb (XT22), or appropriate control mAb. BM MΦ were obtained by in vitro differentiation in RPMI 1640 supplemented with 20% horse serum and 30% supernatant from L929 cells as a source of M-CSF. After 7 days of culture, nonadherent cells were removed, and the remaining adherent MΦ were detached and cultured in RPMI 1640 with 10% heat-inactivated FCS, l-glutamine, and 10 mM HEPES, as described previously (14). TGF-β was measured using a bioassay described previously (15, 16). The (PAI-L) cells used in this assay are mink lung epithelial cells transfected with a luciferase reporter driven by the plasminogen activator inhibitor-1 construct, a gift from Dr. D. Rifkin (New York University Medical Center, New York, NY). This quantitative bioassay is based on the ability of TGF-β to up-regulate plasminogen activator inhibitor-1 expression. The induction of luciferase in these cells is very sensitive (picograms) and specific for TGF-β (as verified by including mAb against TGF-β (Genzyme) in the assays). Luminescence was detected with a Packard counter. Relative light unit values were converted to TGF-β activity (picograms per milliliter) using a rTGF-β (rHuman TGF-β1; R&D Systems) standard curve. Mature PMN (1A8+) were purified by MACS and cultured in DMEM 5% FCS, in the presence or absence of L. major (5:1 parasite:cell ratio), or LPS (40 ng/ml; Sigma-Aldrich) and IFN-γ (50 U; BD Pharmingen) during 24 h. Culture supernatants were harvested, filtered, and frozen at −80°C. To measure total TGF-β levels (active + latent), samples were diluted (2.5 times) in DMEM 0.1% BSA and acid-activated by adding 1 N HCl, then incubated for 1 min at room temperature, and neutralized using adding 1 M NaOH before addition to the assay plate. The treated samples were then used in the PAI-L assay. The luciferase assay was performed as described previously (16), and luciferase activity was determined using the luciferase assay substrate (Promega). PMN apoptosis was quantified by morphology on May-Grünwald-stained cytospins of PMN, by counting at least 600 cells on three different fields per cytospin in a minimum of three different experiments, using bright field microscopy. Cells with chromatin aggregation, cytoplasmic vacuolation, and cell shrinkage were scored as apoptotic. PMN apoptosis was evaluated by a combination of several methods. Early apoptosis was quantified by the expression of membrane phosphatidylserine (PS) detected by annexin V binding using annexin V-FITC as recommended by the manufacturer (BD Pharmingen) and identified by flow cytometry. Neutrophils were stained for surface markers such as Ly6G (1A8-PE mAb) and analyzed using a FACSCalibur and the CellQuest software (BD Biosciences). Because translocation of PS to the external cell surface also occurs during necrosis, it was used in conjunction with the 7-aminoactinomycin D (7AAD) nucleic dye, which stains nonviable cells. This allowed the distinction of early apoptotic cells (annexin V-FITC positive, 7AAD negative) from late apoptotic cells (annexin V-FITC positive, 7AAD-bright) (15). Chromatin fragmentation was detected by the TUNEL assay (In Situ Cell Detection kit; Roche Diagnostics) to visualize late apoptotic cell death by enzymatic labeling of DNA strand breaks with dUTP-FITC and TdT. TUNEL was performed either on cytospins of neutrophils and detected by fluorescent microscopy or in cell suspension in 96-well plates, and detected by FACS analysis. In the coculture experiments, the initial number of neutrophils was constant (5 × 105 PMN/ml), whereas the number of MΦ varied from 1.3, 2.5, 5, 10, or 25 × 105 MΦ/well. A MΦ:PMN ratio of 2:1 (106 MΦ:5 × 105 PMN) was used in most experiments. Cocultures were incubated for 18 h (or 24 h when indicated) at 37°C in a CO2 incubator in RPMI 1640 + 5% FCS (LPS-free as determined by the Limulus amebocyte lysate assay; Invitrogen Life Technologies). The neutrophils were then collected and processed either for cytospins or FACS analysis. In selected experiments, 2.5 × 106 metacyclic parasites were added to the culture. Experiments were performed in 24-well Transwell plates (Costar) in a final volume of 700 μl. PMN (5 × 105) were in the upper compartment of the wells, and (1× or 2.5 × 106) MΦ were seeded in the lower compartment. Cells were cultured for 18 h as described above, and neutrophils were collected, stained, and analyzed by FACS as described above. Statistical analysis was done using the two-tailed t test for unpaired data. It was previously reported that following s.c. infection with L. major, significant differences exist in the composition of the inflammatory cellular infiltrates in mice resistant (C57BL/6) or susceptible (BALB/c) to infection. A few hours after infection, a higher MΦ:PMN ratio occurs in the cellular infiltrates of C57BL/6 mice than in BALB/c mice (8, 9). To investigate whether a higher number of MΦ present at the site of parasite inoculation might reduce the numbers of neutrophils in L. major lesions, we first explored whether MΦ could directly affect PMN apoptosis in vitro. Because recovery of neutrophils in footpads of mice is technically not feasible and reliable, we recovered neutrophils from the peritoneal cavity 4 h after the injection i.p. of 2% starch. A total of 5 × 105 PMN was cultured for 18 h without MΦ and at increasing MΦ:PMN ratios. Early apoptosis was detected by the presence of PS on the PMN surface detected by annexin V staining followed by FACS analysis. Twenty percent of C57BL/6 PMN cultured alone were annexin V+, and culture in the presence of MΦ increased this percentage to 32 and 40% for the 2:1 and 5:1 MΦ:PMN ratios, respectively (Fig. 1⇓A). Correlation between the number of MΦ and neutrophil apoptosis after cocultures of MΦ and PMN from C57BL/6 mice. A, Analysis of early apoptosis of starch-recruited PMN 18 h after culture in absence or presence of MΦ (MΦ:PMN = 2:1 or 5:1). PMN were stained with annexin V-FITC and 1A8-PE. B, Percentage of apoptotic PMN upon culture with different concentrations of MΦ. Cells were recruited i.p. following an injection of starch, isolated, and cultured for 24 h. Cytospins were prepared, and cells were counted as described in Materials and Methods. ∗, p < 0.01. C, PMN apoptosis detected by TUNEL assay, analyzed by FACS, and gated on the 1A8+ PMN population. Gray-filled profile corresponds to PMN cultured for 24 h in absence of MΦ, whereas the black lined profile corresponds to PMN cultured in presence of MΦ at a MΦ:PMN ratio of 2:1. Late apoptosis was then assessed following differential counting of May-Grünwald-stained cytospins. Low numbers of apoptotic PMN (5.4 ± 1.2%), characterized by chromatin aggregation, cytoplasmic vacuolation, and cell shrinkage, were counted on cytospins of PMN cultured without MΦ. A significant increase in the number of apoptotic PMN was measured (18.7 ± 2.9) when the MΦ:PMN ratio was increased to 2:1 (Fig. 1⇑B). MΦ-induced PMN apoptosis was confirmed by TUNEL staining of C57BL/6 cells 18 h after coculture of MΦ with PMN at a 2:1 ratio. The percentage of TUNEL-positive neutrophils was 44% for PMN cultured alone, and increased to 69% in MΦ:PMN cocultures (Fig. 1⇑C). Thus, an increase in MΦ numbers in the cocultures further increases apoptosis of PMN from C57BL/6 mice. To investigate whether MΦ could also induce apoptosis of PMN from BALB/c mice, cocultures of MΦ and neutrophils recruited i.p. with 2% starch were initiated. Morphological analysis and differential counting of cytospins of cocultures of MΦ and PMN revealed no increased PMN apoptosis when PMN were cultured in presence of equal (1:1) or twice (2:1) the number of MΦ (Fig. 2⇓A). To investigate whether a higher number of MΦ could induce PMN apoptosis, the MΦ:PMN ratio was increased to 5:1. No significant difference in the number of apoptotic PMN was counted in four independent experiments (Fig. 2⇓A). FACS analysis of early apoptosis (annexin V+) confirmed that MΦ at a 2:1 PMN ratio did not affect PMN apoptosis, but an increase of early apoptosis was measured at a 5:1 MΦ:PMN ratio (Fig. 2⇓B). Hence, BALB/c MΦ are able to induce PMN apoptosis but are less potent than C57BL/6-derived MΦ in this respect. MΦ from BALB/c mice are less potent inducers of neutrophil apoptosis than C57BL/6 MΦ in cocultures of MΦ and neutrophils. 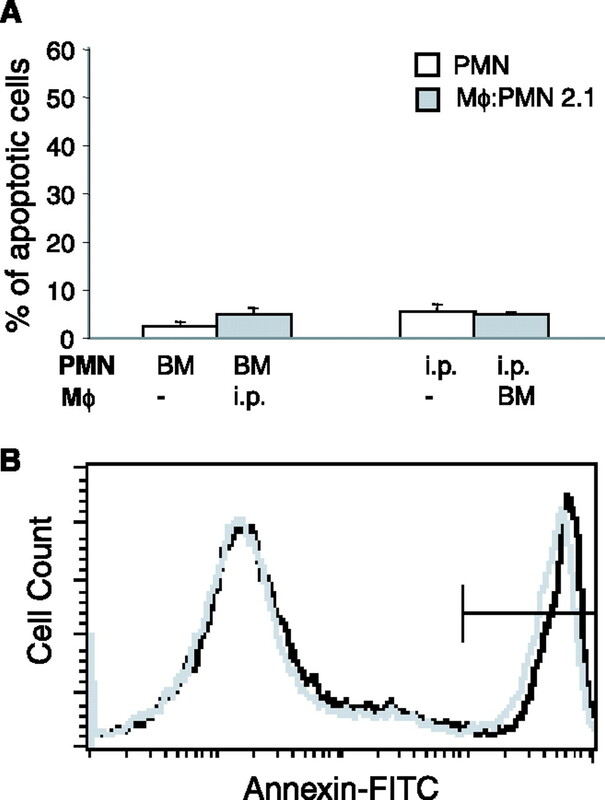 A, Percentage of apoptotic PMN in cocultures of MΦ and PMN with increasing concentrations of MΦ as indicated. Cells were recruited i.p. following an injection of 2% starch in PBS, cultured for 24 h, and cytospins were prepared. Cells were counted as described in Materials and Methods. No significant difference was measured between the different conditions. B, Percentage of apoptotic cells in coculture of MΦ and PMN 18 h after culture, at the indicated ratio. Early apoptosis was detected by staining cells with annexin V and analyzed by FACS, gated on the 1A8+ viable neutrophil population, as described in Materials and Methods. These results are representative of four independent experiments. To study the effect of the mode of cell recruitment on PMN apoptosis, inflammatory cells from C57BL/6 mice were recruited following the injection i.p. with 2% starch or 5 × 107 stationary L. major promastigotes and cultured in the absence, or presence, of MΦ. Late apoptosis was assessed by differential counting of May-Grünwald-stained cytospins. The level of PMN apoptosis in C57BL/6 PMN cultured alone was significantly increased when cells were recruited with L. major, compared with that of cells recruited with starch (Fig. 3⇓A). This increase was further enhanced in presence of MΦ (Fig. 3⇓A). A similar increase in PMN apoptosis was also observed when BALB/c cells were recruited following injection of L. major promastigotes (data not shown). Ability of BALB/c and C57BL/6 MΦ, recruited with L. major to induce PMN apoptosis. A, PMN recruitment with L. major increases the induction of PMN apoptosis by MΦ. Apoptosis of cells recruited following injection of PBS 2% starch (white) or 5 × 107 stationary phase L. major (black). MΦ were incubated with PMN at a 2:1 ratio. Cytospins were stained with May-Grünwald/Giemsa, and >600 cells/slide were counted. The data are representative of four independent experiments. B, L. major-recruited cells C57BL/6 (upper panels) or BALB/c (lower panel) PMN were incubated alone, in the presence of C57BL/6 or BALB/c MΦ in cocultures at a 2:1 MΦ:PMN ratio for 18 h. Cells were collected and stained with annexin V and analyzed by FACS gated on the 1A8+ PMN population. To investigate whether the lower capacity of BALB/c MΦ to induce PMN apoptosis was due to the MΦ, PMN, or both, criss-cross experiments were performed with L. major-recruited cells. C57BL/6 MΦ were incubated for 18 h in presence of C57BL/6- or BALB/c-derived PMN at a MΦ:PMN ratio of 5:1. Similarly, coculture experiments with C57BL/6- or BALB/c- derived PMN were performed using BALB/c MΦ (Fig. 3⇑B). C57BL/6 MΦ could induce equally well apoptosis of BALB/c and C57BL/6 PMN (70 vs 68%). BALB/c-derived MΦ also induced apoptosis of PMN from both strains but to a slightly lower percentage, as shown in Fig. 3⇑B. This small difference in the capacity of BALB/c- and C57BL/6-derived MΦ to induce PMN apoptosis was consistently measured in three independent experiments. A similar difference (10%) in MΦ-induced PMN apoptosis of BALB/c vs C57BL/6 was also observed when cells were recruited with 2% starch (data not shown). Thus, BALB/c and C57BL/6 PMN are equally susceptible to MΦ-induced apoptosis, and MΦ from both strains induce PMN apoptosis, although BALB/c MΦ are less efficient inducers of PMN apoptosis. To further investigate the effect of L. major, and/or a combined effect of both L. major and MΦ on PMN apoptosis, L. major-recruited neutrophils were cultured for 18 h with or without L. major metacyclic promastigotes, in the presence or absence of MΦ (2:1 MΦ:PMN ratio). Early apoptosis was measured by FACS, using annexin V staining as described in Materials and Methods. A representative experiment of three is shown in Fig. 4⇓. 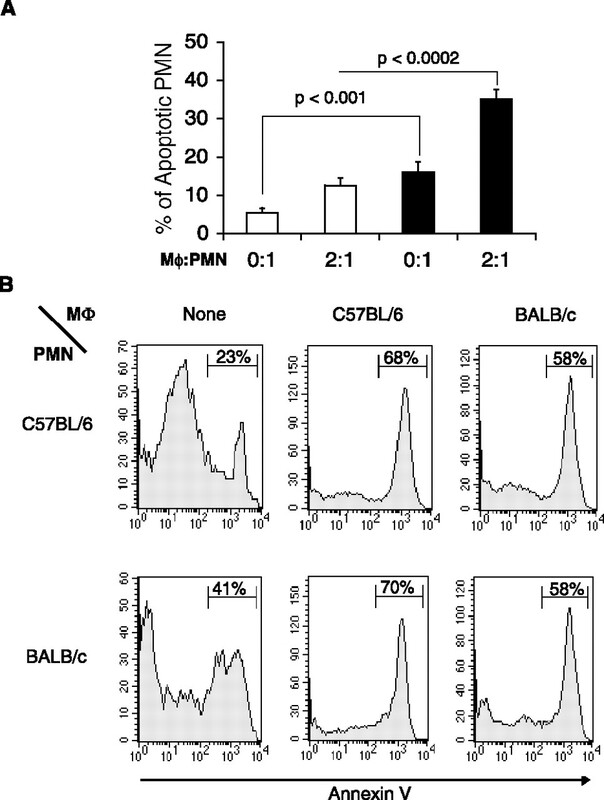 C57BL/6 and BALB/c MΦ induced PMN apoptosis, with a lower induction for BALB/c MΦ (Fig. 4⇓, left panels), in line with the results presented above. Incubation of PMN with L. major in the absence of MΦ had no effect on induction of C57BL/6 PMN apoptosis (Fig. 4⇓, middle panel). In four independent experiments, incubation of L. major-recruited C57BL/6 PMN with L. major did not result in a statistically significant induction of apoptosis (p = 0.3). In contrast, addition of L. major to cocultures of MΦ and PMN significantly induced >80% of apoptosis in C57BL/6 PMN (Fig. 4⇓, right panel). Thus, L. major synergizes with MΦ in enhancing C57BL/6 PMN apoptosis. Addition of L. major promastigotes to BALB/c PMN induced a tiny increase in PMN apoptosis by ∼1.3 times (Fig. 4⇓, middle panel). This induction of early PMN apoptosis by L. major was small but statistically significant (p = 0.016), as determined in four independent experiments. L. major also synergized with BALB/c MΦ in the induction of PMN apoptosis, but only 50% of the PMN became apoptotic (Fig. 4⇓, right panel). Thus, L. major alone mediates an incremental increase in the percentage of apoptotic PMN and synergizes with MΦ in inducing BALB/c PMN apoptosis, but approximately half of the cultured BALB/c PMN remained nonapoptotic. Altogether, these results show that 1) L. major synergizes with MΦ in the induction of PMN apoptosis, and 2) that there exist strain-specific differences between the induction of PMN apoptosis by MΦ and L. major, with BALB/c-derived MΦ being less potent inducers of PMN apoptosis than C57BL/6-derived MΦ. Recruitment of cells and stimulation with L. major increases the MΦ-induced apoptosis of PMN in cocultures. Four hours after injection i.p. of stationary phase L. major promastigotes, mice were sacrificed, and PMN were isolated and purified by MACS as described in Materials and Methods. C57BL/6 (upper panel) or BALB/c (lower panel) PMN were cultured alone (gray profile), in the presence of L. major-recruited MΦ (2:1 MΦ:PMN ratio) (left panels), metacyclic L. major (middle panels), or both (right panels), cultured for 18 h, collected and labeled with annexin V, and analyzed by FACS gated on the 1A8+ PMN population. 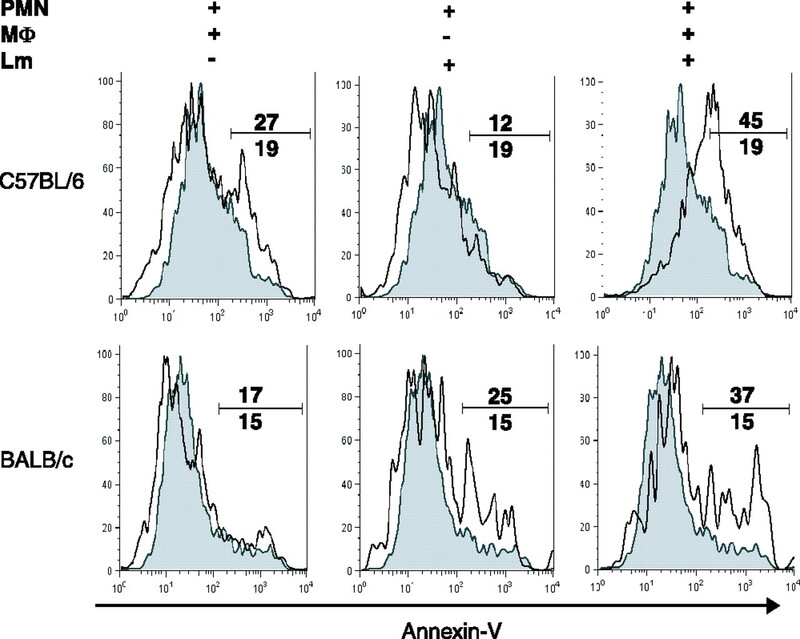 The value above the bar represents the percentage of annexin V+ cells in the white histogram, and the values below the bar represent the percentage of annexin V+ PMN cultured alone (filled in gray). Following infection with L. major, TNF has been reported to be essential in the resolution of the inflammatory lesion (14, 17, 18, 19, 20, 21). Indeed, TNF−/− mice, on a resistant background, infected with L. major developed unhealing lesions comparable to those developed by BALB/c mice (14). Therefore, we investigated whether TNF, a cytokine secreted by both activated MΦ and neutrophils, was involved in the MΦ-induced PMN apoptosis. To this end, coculture of PMN and MΦ from B6.TNF−/− mice were set up. Cells were recruited i.p either with starch or stationary phase L. major and cultured in the absence, or presence, of MΦ at a MΦ:PMN ratio of 2:1. Apoptotic PMNs were scored on cytospins as described in Materials and Methods. MΦ from B6.TNF−/− mice were not able to induce PMN apoptosis following both modes of recruitment (Fig. 5⇓A). Spontaneous apoptosis of TNF−/− PMN was higher than that measured in C57BL/6 PMN, thus revealing either a direct and/or indirect role for soluble TNF in attenuating spontaneous PMN apoptosis. To assess whether PMN from TNF−/− mice had any intrinsic defect and could be susceptible to MΦ-induced apoptosis, MΦ from C57BL/6 mice were cultured in presence of TNF−/− PMN. 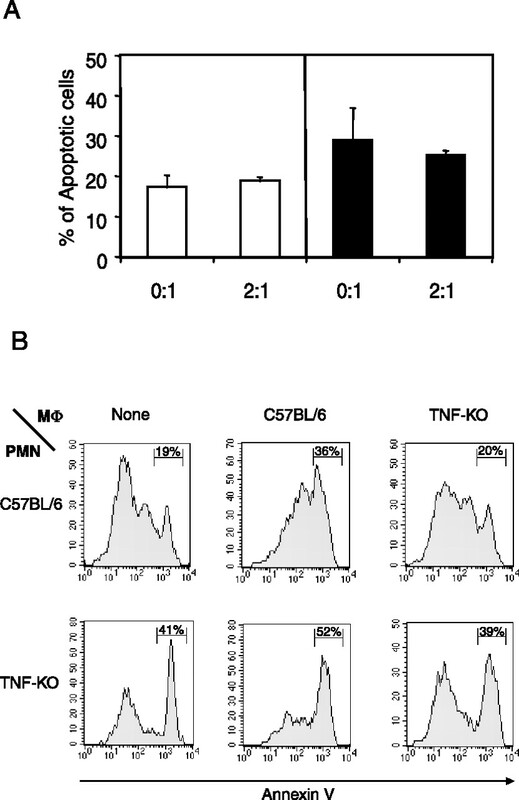 The presence of C57BL/6 MΦ induced TNF−/− PMN apoptosis by 10% (Fig. 5⇓B, middle panel); however, in contrast to the PMN cultured alone in which most apoptotic PMN (37%) were annexin V+ 7AAD− (early apoptosis), in the presence of C57BL/6 MΦ, a substantial part (31%) of the apoptotic PMN became annexin V+ 7AAD+ (late apoptosis/necrosis; data not shown). As a positive control, C57BL/6 MΦ were able to induce C57BL/6 PMN apoptosis. In contrast, MΦ derived from TNF−/− mice did not induce apoptosis of either TNF−/− PMN or C57BL/6 PMN (Fig. 5⇓B, right panel). These results demonstrate that induction of TNF expression by MΦ is needed for PMN apoptosis induction, although TNF production by PMN may also contribute to some extent to apoptosis induction. In the absence of TNF, MΦ are not able to induce PMN apoptosis. A, PMNs and MΦ were recruited following injection of PBS 2% starch (left panel) or 5 × 107 stationary phase L. major promastigotes (right panel) in B6.TNF−/− mice, and coincubated for 18 h as described in Materials and Methods. Cytospin preparations were stained with May-Grünwald/Giemsa and scored for apoptotic PMN. B, Measure of C57BL/6 (upper panel) or TNF−/− (lower panel) PMN apoptosis 18 h after coincubation of MΦ and PMN from C57BL/6 or B6.TNF−/− mice at a 2:1 ratio. Gated PMN were stained with annexin V-FITC and 7AAD and analyzed by FACS. This is a representative experiment of three. The addition of soluble hTNF to cultures of C57BL/6 neutrophils (recruited by injection of 2% starch) did not induce any increase in apoptosis of mouse inflammatory PMN (data not shown). This lack of apoptosis induction by TNF on PMN was previously reported for human and rat inflammatory PMN (22, 23). To demonstrate that both MΦ and neutrophils need to be activated to respond to MΦ-induced apoptosis, we isolated BM-derived neutrophils and L. major-recruited neutrophils for subsequent coculture with L. major-recruited MΦ or BM-derived MΦ. Neutrophil apoptosis was quantified by morphology on May-Grünwald-stained cytospins of PMN, as described in Material and Methods. Only a few apoptotic PMN were visually scored on cytospins, and no MΦ-induced PMN apoptosis was detected in these cocultures (Fig. 6⇓A). These results were confirmed with 7AAD staining and FACS analysis (data not shown). L. major-derived MΦ also failed to induce early apoptosis of BM-derived neutrophils, as detected by annexin V staining (Fig. 6⇓B). Thus, to induce PMN apoptosis, both PMN and MΦ need to be activated following recruitment to the site of the inflammatory stimulus. BM-derived MΦ fail to induce PMN apoptosis. A, Coculture of BM-derived PMN cultured with L. major-recruited MΦ or BM-derived MΦ cultured with L. major-recruited PMN. Cytospins preparations were stained and counted as described in Materials and Methods. B, Early apoptosis of BM-derived PMN incubated with or without L. major-recruited MΦ. Neutrophils, gated with the 1A8 mAb, were stained with annexin V and analyzed by FACS. Morphological examination of cytospins obtained from cocultures of MΦ with neutrophils revealed that neutrophils that were often found in close contact with MΦ, presented the typical features of apoptotic cells including chromatin aggregation, cytoplasmic, and cell shrinkage (Fig. 7⇓A, right panel). PMN cultured alone, however, predominantly represented healthy neutrophils with their characteristic multilobular nucleus (Fig. 7⇓A, left panel). In the experiments shown in Fig. 7⇓A, the MΦ used in the cocultures were fixed first for 45 min in PBS 1% PFA, as described in Materials and Methods, to prevent secretion of TNF while still retaining membrane TNF on the cell surface. These results thus suggest that it is the mTNF expressed on MΦ which is important in the induction of PMN apoptosis. mTNF on MΦ is sufficient to induce PMN apoptosis. A, Morphological appearance of mouse PMN (left panel) or PMN incubated with MΦ (PMN:MΦ ratio 2:1) (right panel) from C57BL/6 mice. A total of 5 × 105 PMN was cultured in presence of 106 MΦ for 24 h. Cytospin preparations were stained with May-Grünwald/Giemsa. The arrow points to an apoptotic PMN. m, Macrophage; ×100. B, PMN were recruited 4 h after injection i.p. of 5 × 107 stationary phase L. major and incubated for 18 h without or in presence of L. major-recruited MΦ from mTNFΔ/Δ mice. Apoptosis of 1A8+ gated PMN was analyzed following staining with 7AAD and annexin V. The percentage of the cells in each quadrant is given below the figure. Results are representative of three experiments. C, Unfixed L. major-recruited MΦ and PMN from C57BL/6 and BALB/c mice were cultured in different chambers, separated by a membrane in a Transwell system. Eighteen hours later, PMN were collected, stained with the neutrophil-specific 1A8 mAb, annexin V, and 7AAD, and their apoptotic status was analyzed by FACS. D, Production of TGF-β in BM mature (1A8+) PMN cultured in vitro during 24 h in presence or absence of L. major (5:1 parasite:cell ratio). As a positive control, PMN were stimulated with 50 U of IFN-γ and 40 ng/ml LPS. Results are the mean ± SD of three independent experiments performed in duplicates. In black, C57BL/6 PMN; in white, BALB/c PMN. ∗, p < 0.05 between BALB/c and C57BL/6 PMN. To firmly establish that mTNF alone is sufficient for the induction of PMN apoptosis by MΦ, cells from memTNFΔΔ mice, in which an uncleavable mutant form of TNF was knocked in (11), were used in coculture experiments (Fig. 7⇑B). The presence of mTNF was sufficient to restore the induction of PMN apoptosis by MΦ, as revealed by FACS analysis of cells stained with 1A8, annexin V, and 7AAD. The percentage of nonapoptotic PMN decreased from 59 to 25% when the PMN were cultured in presence of unfixed mTNF+ MΦ, and the percentage of late apoptotic cells (annexin V+ 7AAD+) increased from 13 to 48% of the PMN population (Fig. 7⇑B). To confirm these results and establish that cell-to-cell contact is required for the induction of PMN apoptosis, L. major-recruited C57BL/6 MΦ and neutrophils were cultured in different compartments of Transwell plates, separated by membranes that prevented direct cell-to-cell contact while allowing the diffusion of soluble mediators. For these experiments, unfixed MΦ were used. Eighteen hours later, neutrophils were collected, stained with annexin V and 7AAD, and analyzed by FACS. A representative experiment performed with unfixed MΦ is presented in Fig. 7⇑C. No induction of PMN apoptosis was observed using unfixed MΦ when these MΦ were physically separated from neutrophils. Such an absence of MΦ-induced PMN apoptosis was observed at MΦ:PMN ratios of 2:1 and 5:1 (Fig. 7⇑C, middle and right panels) using cells isolated from both C57BL/6 and BALB/c mice (Fig. 7⇑). Thus, the absence of induction of PMN apoptosis by unfixed MΦ, physically separated from PMN, strongly argues against the involvement of a soluble factor in MΦ-induced PMN apoptosis. Fixed MΦ also failed to induce PMN apoptosis when cultured under the same Transwell culture (data not shown). To investigate whether the higher ratio of MΦ to PMN required to induce apoptosis of BALB/c PMN was due to lower expression of mTNF in BALB/c MΦ, we measured by FACS the level of mTNF expression in peritoneally recruited BALB/c and C57BL/6 PMN MΦ, 16 h after injection i.p. of L. major. Detection of mTNF with anti-TNF mAbs, however, turned out to be difficult, possibly resulting from a conformational change of the membrane bound TNF. For example in BY L6 hybridomaT cells that are transfected with an uncleavable form of TNF, >80% of the cells stained positive for intracellular TNF, whereas surface expression of mTNF was only shifted by <1.5% compared with mock-transfected cells (data not shown); nevertheless, mTNF on these cells was previously shown to be biologically functional (24). Similarly, only low levels of mTNF were detectable in both BALB/c and C57BL/6 MΦ recruited i.p. following injection with L. major. However, with the available reagents, no substantial differences in the cell surface expression of mTNF on MΦ from BALB/c and C57BL/6 mice were observed. Increased levels of cell surface mTNF were reported on MΦ following LPS stimulation in vitro (11); therefore, L. major-recruited MΦ were stimulated in vitro during 1 h with LPS and analyzed for mTNF expression by FACS. C57BL/6 MΦ expressed slightly higher levels of mTNF than BALB/c MΦ that were treated identically (data not shown). Thus, it was not possible with the available tools to detect a significant change in mTNF surface expression in BALB/c vs C57BL/6 L. major-recruited MΦ. Significant expression of mTNF was detectable only subsequent to further stimulation with LPS. Therefore, it is not possible to rule out the existence of small differences in mTNF expression levels between both strains of MΦ during in vivo stimulation. The autocrine production of cytokines may differ between BALB/c and C57BL/6 PMN and thus could contribute to their distinct susceptibility to MΦ-induced PMN apoptosis. Differential production of cytokines blocking PMN apoptosis such as GM-CSF, or TGF-β, may explain the distinct sensitivity of C57BL/6 PMNs compared with BALB/c PMNs. Therefore, we have assessed the production of TGF-β in BM-derived mature BALB/c and C57BL/6 PMN by bioassay (15) (16). PMN were stimulated or not with L. major stationary phase promastigotes (5:1 ratio) for 24 h, and the supernatant was collected for analysis. As a positive control, PMN were activated with LPS and IFN-γ. Significantly higher levels of biologically active TGF-β were secreted by BALB/c PMN compared with the levels measured in supernatants of C57BL/6 PMN cultured in the presence or absence of L. major (Fig. 7⇑D). Similar differences in TGF-β secretion were also measured in L. major-recruited peritoneal PMN cultured in vitro; however, lower levels of biologically active TGF-β were measured in the supernatant, possibly due to the rapid release of this cytokine in the peritoneum (data not shown). Thus, the significantly higher secretion of bioactive TGF-β by BALB/c PMN could contribute to their lower sensitivity to MΦ-induced apoptosis. We report in this study that inflammatory MΦ from C57BL/6 mice induce a cell contact-dependent apoptosis of PMN, a process that is further amplified following infection with L. major. We show that increasing the number of MΦ in cocultures of PMN and MΦ results in a significant increase of PMN apoptosis. Moreover, we demonstrate that TNF is required in this process. Indeed, MΦ recruited from TNF−/− mice failed to induce PMN apoptosis. We further show, using inflammatory cells derived from mice expressing only mTNF (memTNFΔ/Δ), that expression of mTNF on the MΦ membrane, without secretion of soluble TNF, is necessary to induce PMN apoptosis in vitro. The murine model of infection with L. major has been studied extensively to analyze the factors leading to resistance or susceptibility to this protozoan parasite. Following infection with L. major, most inbred mouse strains such as C57BL/6 develop only a small lesion that is self-healing, and they are able to control parasite replication efficiently. On the contrary, BALB/c mice fail to control lesion size, develop nonhealing lesions, and do not control parasite replication (25). It was previously reported that the ratio of MΦ to PMN is lower at the site of parasite inoculation in BALB/c mice with equal numbers of PMN and MΦ present from day 2 after infection, persisting for at least 10 days; whereas in C57BL/6 mice, the MΦ:PMN ratio measured 2 days after infection (3.5:1) further increases to 30:1 on day 3 days after infection (8). We thus investigated a potential role of MΦ in PMN-induced apoptosis. To this end, we isolated i.p. inflammatory cells and set up in vitro cocultures of MΦ and PMN. It is important to consider that other factors found at the site of Leishmania inoculation by the phlebotome (the skin) may also contribute to neutrophil apoptosis/survival, which may require further analysis. Indeed, 4 h after infection of C57BL/6 with L. major i.p, the ratio of MΦ to PMN in the cellular infiltrate was significantly higher than in L. major-infected BALB/c mice, as observed following infection s.c. of a high inoculum of L. major. However, the kinetics of neutrophils turnover following injection of L. major in the peritoneal cavity was more rapid than following infection s.c. of 3 × 106 parasites in the footpads (C. Allenbach and F. Tacchini-Cottier, unpublished observation), suggesting that additional mediators secreted at the site of s.c. infection, such as chemokines, may also contribute to the observed differential persistence and/or removal of PMN at the site of parasite inoculation. The observed MΦ-mediated induction of neutrophil apoptosis followed by the ingestion of apoptotic cells by MΦ during the early stages of infection very likely contribute to the subsequent rapid resolution of the inflammation in C57BL/6 mice infected s.c. with L. major. This may occur by switching off the production of proinflammatory mediators, preventing the release of disease promoting mediators from necrotic cells, and stimulating the production of anti-inflammatory cytokines such as TGF-β (23, 26), thus substantially modifying the microenvironment at the site of parasite inoculation. Interestingly, it was recently reported that coculture of L. major-infected MΦ from C57BL/6 mice with dead neutrophils promoted the killing of L. major and secretion of TNF (27). Thus, induction of neutrophil apoptosis by MΦ could contribute efficiently to the control of infection with L. major. The same authors also reported that on the contrary, i.e., incubation of dead neutrophils with L. major-infected MΦ from BALB/c mice, exacerbated replication of L. major induced MΦ production of TGF-β but did not induce production of TNF (27). Hence, our present observations of an attenuated TNF-dependent neutrophil apoptosis induction by BALB/c MΦ might be explained by such a reduced TNF induction in inflammatory cells of BALB/c mice. Unfortunately, the available reagents did not allow for a conclusive quantitation of cell surface-expressed mTNF in BALB/c- vs C57BL/6-derived MΦ. Furthermore, additional mechanisms that may influence PMN apoptosis cannot be excluded, for instance, involving differences in the expression pattern of cell surface molecules including the presence of integrins such as β2 molecules on MΦ (28, 29), that may lead to a differential recognition and/or attachment of MΦ to neutrophils in the two different strains. The effect of an autocrine production of cytokines by PMN may differ in L. major susceptible vs resistant mice and also contribute to the observed MΦ-induced PMN apoptosis. Distinct secretion of cytokines by PMN was previously reported in PMN of mouse strains susceptible vs resistant to infections with pathogens such as Candida albicans (30), Staphylococcus aureus (6), and L. major (10, 31). Differential production of cytokines blocking PMN apoptosis such as GM-CSF or TGF-β may explain the distinct sensitivity of C57BL/6 and BALB/c PMNs to MΦ-induced apoptosis. In this line, we report that BALB/c PMN secrete significantly higher levels of biologically active TGF-β compared with that released by C57BL/6 PMN. These higher levels of TGF-β may contribute to the delay of MΦ-induced PMN apoptosis observed in BALB/c PMN. This point will deserve further investigation both in vitro and in vivo. Early after s.c. or i.p. infection with L. major, the proportion of MΦ in the inflammatory cells recruited in BALB/c mice is significantly lower than in C57BL/6 mice. Thus, during the first days following infection with L. major, the number of MΦ present in the cellular infiltrate of BALB/c mice may not be sufficient to induce PMN apoptosis. Following s.c. inoculation of the parasite, this delay may be further increased by a lower level of TNF secreted locally in BALB/c mice, and thus lower levels of mTNF expressed at the surface of inflammatory MΦ. However, due to technical limitations, it was difficult to reliably measure in vitro differences in mTNF expression on MΦ, unless the MΦ were activated with LPS. In the latter case, levels of mTNF were slightly but not significantly higher in C57BL/6 than in BALB/c MΦ. At this stage, it is difficult to extrapolate these results in vivo, but it has been reported that following s.c. infection with L. major, activation of BALB/c MΦ differ from that of C57BL/6 MΦ (32), suggesting that expression of MΦ surface molecules may also be distinct. The role of TNF has been extensively studied in the model of infection with L. major. TNF has been shown to synergize with IFN-γ in inducing parasite killing (33, 34). In vivo, mice resistant to infection with L. major were shown to produce significant amounts of TNF in their draining lymph nodes during the course of infection, whereas no TNF was detectable in susceptible animals (17). Following infection with L. major, transgenic mice on a C57BL/6 resistant genetic background expressing high levels of soluble hTNFRp55 fusion protein, or TNF−/− mice, ultimately developed severe ulcerating lesions but were able to clear their parasites (14, 18). Mice genetically deficient for TNF receptor 1, but not TNF receptor 2, developed nonhealing lesions with a transient increase in parasite burden, but eventually cleared the parasites from their lesions (19, 20, 21). We report in this study that MΦ from TNF−/− mice cultured with neutrophils from either TNF−/− or C57BL/6 mice were unable to induce neutrophil apoptosis. We further showed, using MΦ from memTNFΔ/Δ mice and Transwell experiments, that the presence of membrane TNF on MΦ was necessary to induce neutrophil apoptosis and required cell-to-cell contacts. Thus, in C57BL/6 mice infected with L. major s.c., TNF could play a major role in the control of neutrophil apoptosis at the site of parasite inoculation. This control appears essential in the resolution of the inflammatory lesion elicited following infection with L. major. Interestingly, the roles of soluble vs membrane TNF in PMN apoptosis appear distinct, because soluble TNF may contribute to neutrophil survival while membrane TNF induces their apoptosis. MΦ are known to ingest PMN that undergo spontaneous apoptosis. We show here, in experiments performed in vitro, that MΦ can also actively induce neutrophil apoptosis. These results are in agreement with previous findings obtained in an experimental rat model of wound healing (29). MΦ isolated from the wounds were found to induce neutrophil apoptosis in a cell contact-dependent manner. Circumstantial evidence suggested that in addition to CD36 and CD61, cell surface-associated TNF was involved in this process. Incubation of purified inflammatory mouse C57BL/6 PMN with L. major alone did not induce PMN apoptosis. This is in line with experiments performed with blood-derived human neutrophils (35, 36) in which L. major was reported to induce a delay in spontaneous neutrophil apoptosis. It would be interesting to investigate whether this effect would persist if human inflammatory neutrophils were used, and whether the neutrophils were cultured in presence of MΦ, because it has been reported that following transmigration through endothelial cells, neutrophils differ functionally from blood-derived PMN also in their survival (1, 28). A delay in the induction of apoptotic PMN was also observed 3 days after inoculation of L. major s.c. in mice, using an air pouch technique (35). Interestingly, the mice used in those experiments were BALB/c mice that reportedly showed lower MΦ:PMN ratios than in resistant C57BL/6 mice following s.c. infection with L. major (8, 10). Taken together, our results demonstrate that MΦ, through their mTNF, induce PMN apoptosis in a mTNF-dependent manner. The efficiency of MΦ-induced apoptosis induction in PMN is further enhanced by the presence of the parasite. MΦ-induced PMN apoptosis may also be observed in cells from BALB/c mice, however, at a substantially reduced efficiency. The molecular basis for this difference is currently under investigation. Spontaneous apoptosis of both BALB/c and C57BL/6 PMN is blocked by the caspase inhibitor z-VAD-fmk (inhibitor of pan-caspases). However, MΦ-induced apoptosis is only partially blocked by this inhibitor (C. Allenbach and F. Tacchini-Cottier, unpublished results). Comparison of several genes that either promote or block apoptosis should reveal whether there exist strain differences at this level. In L. major-infected BALB/c mice, the low apoptosis induction in PMN is likely to be further attenuated in vivo by the reported low MΦ:PMN ratio in the cellular infiltrates in the lesions. The quantitative as well as qualitative differences in the inflammatory cells recruited within hours of infection could thus lead to a distinct resolution of the L. major-induced inflammatory processes. Further investigations on how to control the early neutrophil accumulation, but also mTNF expression on MΦ, may reveal new strategies to prevent exacerbating tissue damage in infections that, as for experimental cutaneous leishmaniasis, require early control of granulocytic infiltration. We thank Prof. Jacques Mauël for stimulating discussions and critical reading of the manuscript, Christine Zweifel for help with the TGF-β bioassay, and Y. Hauyon and O. Froelicher for technical assistance. ↵1 This work was supported by grants from the Swiss National Foundation for Scientific Research (3200-06744.01; to F.T.-C.). ↵3 Abbreviations used in this paper: PMN, polymorphonuclear neutrophil; mTNF, membrane TNF; MΦ, macrophage; BM, bone marrow; PS, phosphatidylserine; 7AAD, 7-aminoactinomycin D.
Watson, R. W., O. D. Rotstein, A. B. Nathens, J. Parodo, J. C. Marshall. 1997. Neutrophil apoptosis is modulated by endothelial transmigration and adhesion molecule engagement. J. Immunol. 158: 945-953. Kettritz, R., M. L. Gaido, H. Haller, F. C. Luft, C. J. Jennette, R. J. Falk. 1998. Interleukin-8 delays spontaneous and tumor necrosis factor-α-mediated apoptosis of human neutrophils. Kidney Int. 53: 84-91. Cassatella, M. A.. 1999. Neutrophil-derived proteins: selling cytokines by the pound. Adv. Immunol. 73: 369-509. Romani, L., A. Mencacci, E. Cenci, G. Del Sero, F. Bistoni, P. Puccetti. 1997. An immunoregulatory role for neutrophils in CD4+ T helper subset selection in mice with candidiasis. J. Immunol. 158: 2356-2362. Bliss, S. K., A. J. Marshall, Y. Zhang, E. Y. Denkers. 1999. Human polymorphonuclear leukocytes produce IL-12, TNF-α, and the chemokines macrophage-inflammatory protein-1α and -1β in response to Toxoplasma gondii antigens. J. Immunol. 162: 7369-7375. Tsuda, Y., H. Takahashi, M. Kobayashi, T. Hanafusa, D. N. Herndon, F. Suzuki. 2004. Three different neutrophil subsets exhibited in mice with different susceptibilities to infection by methicillin-resistant Staphylococcus aureus. Immunity 21: 215-226. Sacks, D., N. Noben-Trauth. 2002. The immunology of susceptibility and resistance to Leishmania major in mice. Nat. Rev. Immunol. 2: 845-858. Beil, W. J., G. Meinardus-Hager, D. C. Neugebauer, C. Sorg. 1992. Differences in the onset of the inflammatory response to cutaneous leishmaniasis in resistant and susceptible mice. J. Leukocyte Biol. 52: 135-142. Sunderkotter, C., M. Kunz, K. Steinbrink, G. Meinardus-Hager, M. Goebeler, H. Bildau, C. Sorg. 1993. Resistance of mice to experimental leishmaniasis is associated with more rapid appearance of mature macrophages in vitro and in vivo. J. Immunol. 151: 4891-4901. Tacchini-Cottier, F., C. Zweifel, Y. Belkaid, C. Mukankundiye, M. Vasei, P. Launois, G. Milon, J. A. Louis. 2000. An immunomodulatory function for neutrophils during the induction of a CD4+ Th2 response in BALB/c mice infected with Leishmania major. J. Immunol. 165: 2628-2636. Ruuls, S. R., R. M. Hoek, V. N. Ngo, T. McNeil, L. A. Lucian, M. J. Janatpour, H. Korner, H. Scheerens, E. M. Hessel, J. G. Cyster, et al 2001. Membrane-bound TNF supports secondary lymphoid organ structure but is subservient to secreted TNF in driving autoimmune inflammation. Immunity 15: 533-543. Marino, M. W., A. Dunn, D. Grail, M. Inglese, Y. Noguchi, E. Richards, A. Jungbluth, H. Wada, M. Moore, B. Williamson, et al 1997. Characterization of tumor necrosis factor-deficient mice. Proc. Natl. Acad. Sci. USA 94: 8093-8098. Louis, J., E. Moedder, R. Behin, H. Engers. 1979. Recognition of protozoan parasite antigens by murine T lymphocytes. I. Induction of specific T lymphocyte-dependent proliferative response to Leishmania tropica. Eur. J. Immunol. 9: 841-847. Chakour, R., R. Guler, M. Bugnon, C. Allenbach, I. Garcia, J. Mauel, J. Louis, F. Tacchini-Cottier. 2003. Both the Fas ligand and inducible nitric oxide synthase are needed for control of parasite replication within lesions in mice infected with Leishmania major whereas the contribution of tumor necrosis factor is minimal. Infect. Immun. 71: 5287-5295. Titus, R. G., B. Sherry, A. Cerami. 1989. Tumor necrosis factor plays a protective role in experimental murine cutaneous leishmaniasis. J. Exp. Med. 170: 2097-2104. Garcia, I., Y. Miyazaki, K. Araki, M. Araki, R. Lucas, G. E. Grau, G. Milon, Y. Belkaid, C. Montixi, W. Lesslauer, et al 1995. Transgenic mice expressing high levels of soluble TNF-R1 fusion protein are protected from lethal septic shock and cerebral malaria, and are highly sensitive to Listeria monocytogenes and Leishmania major infections. Eur. J. Immunol. 25: 2401-2407. Vieira, L. Q., M. Goldschmidt, M. Nashleanas, K. Pfeffer, T. Mak, P. Scott. 1996. Mice lacking the TNF receptor p55 fail to resolve lesions caused by infection with Leishmania major, but control parasite replication. J. Immunol. 157: 827-835. Nashleanas, M., S. Kanaly, P. Scott. 1998. Control of Leishmania major infection in mice lacking TNF receptors. J. Immunol. 160: 5506-5513. Kanaly, S. T., M. Nashleanas, B. Hondowicz, P. Scott. 1999. TNF receptor p55 is required for elimination of inflammatory cells following control of intracellular pathogens. J. Immunol. 163: 3883-3889. Tsuchida, H., Y. Takeda, H. Takei, H. Shinzawa, T. Takahashi, F. Sendo. 1995. In vivo regulation of rat neutrophil apoptosis occurring spontaneously or induced with TNF-α or cycloheximide. J. Immunol. 154: 2403-2412. Mueller, C., N. Corazza, S. Trachsel-Loseth, H. P. Eugster, M. Buhler-Jungo, T. Brunner, M. A. Imboden. 1999. Noncleavable transmembrane mouse tumor necrosis factor-α (TNFα) mediates effects distinct from those of wild-type TNFα in vitro and in vivo. J. Biol. Chem. 274: 38112-38118. Locksley, R. M., J. A. Louis. 1992. Immunology of leishmaniasis. Curr. Opin. Immunol. 4: 413-418. Huynh, M. L., V. A. Fadok, P. M. Henson. 2002. Phosphatidylserine-dependent ingestion of apoptotic cells promotes TGF-β1 secretion and the resolution of inflammation. J. Clin. Invest. 109: 41-50. Ribeiro-Gomes, F. L., A. C. Otero, N. A. Gomes, M. C. Moniz-de-Souza, L. Cysne-Finkelstein, A. C. Arnholdt, V. L. Calich, S. G. Coutinho, M. F. Lopes, G. A. DosReis. 2004. Macrophage interactions with neutrophils regulate Leishmania major infection. J. Immunol. 172: 4454-4462. Coxon, A., T. Tang, T. N. Mayadas. 1999. Cytokine-activated endothelial cells delay neutrophil apoptosis in vitro and in vivo: a role for granulocyte/macrophage colony-stimulating factor. J. Exp. Med. 190: 923-934. Meszaros, A. J., J. S. Reichner, J. E. Albina. 2000. Macrophage-induced neutrophil apoptosis. J. Immunol. 165: 435-441. Romani, L., A. Mencacci, E. Cenci, R. Spaccapelo, G. Del Sero, I. Nicoletti, G. Trinchieri, F. Bistoni, P. Puccetti. 1997. Neutrophil production of IL-12 and IL-10 in candidiasis and efficacy of IL-12 therapy in neutropenic mice. J. Immunol. 158: 5349-5356. Chen, L., Z. H. Zhang, T. Watanabe, T. Yamashita, T. Kobayakawa, A. Kaneko, H. Fujiwara, F. Sendo. 2005. The involvement of neutrophils in the resistance to Leishmania major infection in susceptible but not in resistant mice. Parasitol. Int. 54: 109-118. Kropf, P., J. M. Fuentes, E. Fahnrich, L. Arpa, S. Herath, V. Weber, G. Soler, A. Celada, M. Modolell, I. Muller. 2005. Arginase and polyamine synthesis are key factors in the regulation of experimental leishmaniasis in vivo. FASEB J. 19: 1000-1002. Liew, F. Y., S. Millott, C. Parkinson, R. M. Palmer, S. Moncada. 1990. Macrophage killing of Leishmania parasite in vivo is mediated by nitric oxide from l-arginine. J. Immunol. 144: 4794-4797. Green, S. J., M. S. Meltzer, J. B. Hibbs, Jr, C. A. Nacy. 1990. Activated macrophages destroy intracellular Leishmania major amastigotes by an l-arginine-dependent killing mechanism. J. Immunol. 144: 278-283. Aga, E., D. M. Katschinski, G. van Zandbergen, H. Laufs, B. Hansen, K. Muller, W. Solbach, T. Laskay. 2002. Inhibition of the spontaneous apoptosis of neutrophil granulocytes by the intracellular parasite Leishmania major. J. Immunol. 169: 898-905.
van Zandbergen, G., M. Klinger, A. Mueller, S. Dannenberg, A. Gebert, W. Solbach, T. Laskay. 2004. Cutting edge: neutrophil granulocyte serves as a vector for Leishmania entry into macrophages. J. Immunol. 173: 6521-6525.